이 600K (Google map) 는 아름다운 남해안으로 보내줄것입니다, 그래서 이름을 "Southern Beauty - 남해안의 아름다움"이라고 하였습니다. 라이더들은 동쪽으로 벗어나는 루트로 광주에서 출발하여 고흥반도쪽인 남쪽방향으로 턴합니다. 섬의 둘레, 다리, 항구 그리고 낚시터를 지난 후 라이더들은 남은 밤을 이용 고흥을 떠나 서쪽방향으로 돌아 해안을 따라서 달리게됩니다. 400km후에 라이더들은 우리의 가장 남쪽 목적지인 땅끝에 도착하게될 것입니다. 여기서 우리는 해변과 작별을 고하고 북쪽인 해남쪽으로 돈 다음 광주에 있는 종착점으로 향합니다. 큐표들, 지도들, 컨트롤 정보, 구글맵의 루트와 광주 시작지점, 등록한 라이더들의 명부, 컨트롤 카드, “정보와 규칙”, 라이더들을 위한 정보 그리고 0gps 경로 (.gpx 형식)이 포함된 zip파일들이 공시되었습니다. (웹사이트의 사이드바에도 있습니다. 라이더들은 컨트롤 카드를 프린트해야 하고, 정보를 체워 넣은다음 라이드 출발지점에 가져오셔서 확인받으셔야 합니다. 이번 라이드 동안에 야간주행도 포함되어있습니다, 라이더들은 “야간주행규칙”을 따라주셔야 합니다 (야간주행 정보 및 규칙) . 스마트폰(아이폰과 같은)으로 gpx파일 사용법을 알고 싶으시면 서상원 - Seo Wang Won (010-6653-6667)님에게 연락을 취하십시오. 지도와 gps 경로를 준비해주신 Jan Boonstra 님과 번역을 해주신 김장선 – Kim Jang Seon (010-9287-8653) and Lee Misun 님께 감사드립니다. This 600K (Google map) will take us to the beautiful southern shores, thus its name "Southern Beauty - 남해안의 아름다움". 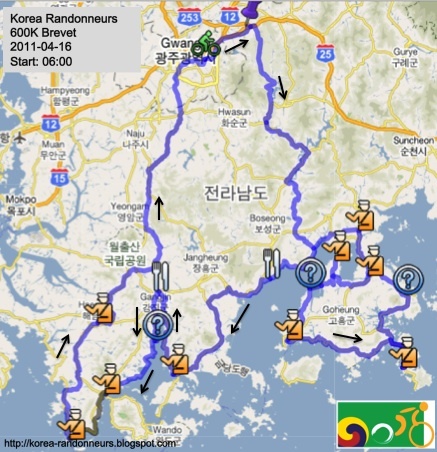 From Gwangju, riders will take the eastern escape route and then turn south to the Goheung peninsula. 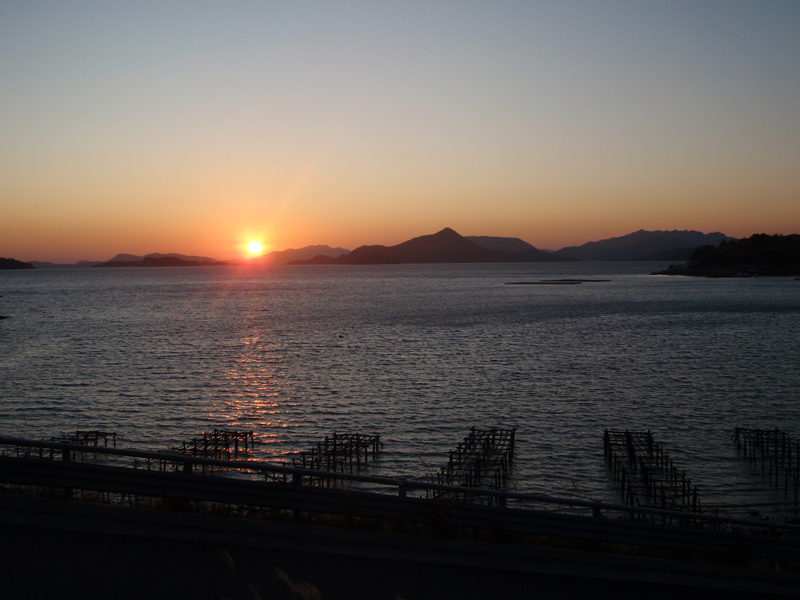 After a full circle exploring islands, bridges, harbors and fishing villages, riders will leave Goheung and turn west to follow the shore throughout the remainder of the night. After ~440 km riders will reach Ttangkkeut, our most southern destination. Here we will bid farewell to the ocean and turn north to Haenam and then to the finish in Gwangju. Cue sheets, maps, control information, Google maps of route and Gwangju start site, list of registered riders, control card, “Information and Rules”, information for riders and a zip file containing gps tracks (.gpx format) been posted (see also sidebar on web site). Riders need to print out the control card, fill in the information and bring it to the check-in at the ride start. Since this ride will involve cycling during the night, riders need to follow the "night riding rules". 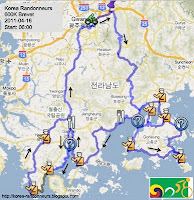 For the use of gpx files to smart phones (such as iPhone) please contact Seo Sang Won (010-6653-6667). Many thanks to Jan Boonstra for preparing the maps, cue sheets and gps tracks and Sang Jeon Kim and Lee Misun for translation.